My Lion Hunting Apprenticeship is designed to help less experienced hunters learn the skills of bare ground lion hunting. I don’t claim to know everything and continue to learn something new every time I take my hounds hunting. However, I do have over 27 years experience in successful mountain lion hunting and can help eliminate some of the common pitfalls and mistakes. 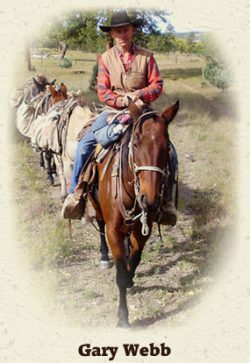 This is a one on one study course with the classroom being on the back of a mule following hounds in mountain lion country. The only way to learn this type of hunting is by doing it, picking my brain, asking questions, and seeing first hand what to do in certain situations. Apprentice can expect to be in the field hunting at least 20 days per month. We will be actually taking some clients through out the course. Student should be in excellent physical condition and have some horseback experience. You may bring 2 dogs of your own while attending my course. Depending on your experience level, I recommend hunting with me as long as your time or budget will allow. The more different situations we encounter, the more you will know when you leave here. We are accepting applications for this apprenticeship through July 31, 2018. Successful applicants will be notified no later than August 15, 2018. Feel free to call me with any questions or concerns you may have. Gary Webb 575-536-9368.